Reheating a microwaveable pizza is as easy as mealtime gets, but the end result isn't very inspiring. Making your own pizza enables you to use your choice of a good-quality sauce, toppings and cheese, but finishing it in the microwave is a challenging proposition. While the toppings will heat properly and the cheese will melt, it's difficult to get a good crust in the microwave because of its lack of browning. You can combat that failing by using a microwave browning plate or a prepared, pre-cooked pizza crust. 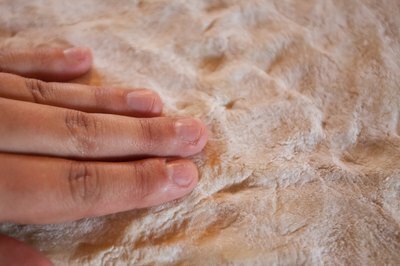 Prepare a pizza crust using your favorite recipe. Roll, stretch or toss it until it reaches the correct size for your browning plate -- usually 10 to 12 inches -- and your preferred thickness. 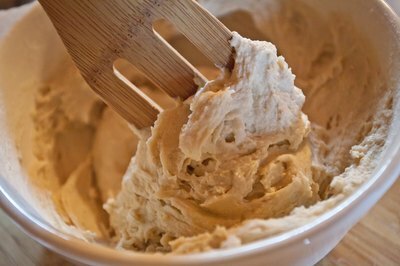 Cover the dough loosely with a towel, and let it rest while you prepare the other ingredients. 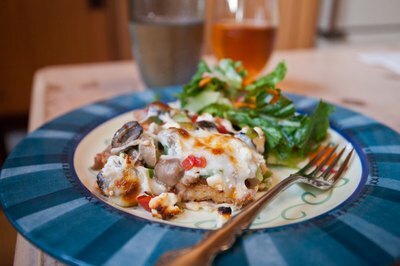 Shred mozzarella and other cheeses as desired, mix your sauce, and slice or chop any other toppings as appropriate. 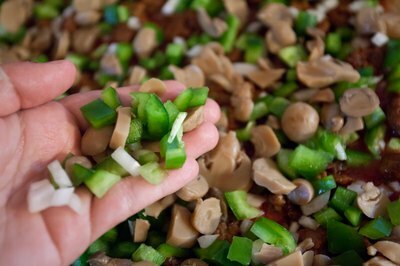 If you prefer toppings such as onions, mushrooms or bell peppers to be completely cooked, saute and drain them ahead of time. Spray the browning pan lightly with oil and preheat it in your microwave for 2 to 3 minutes, as directed by the manufacturer. Once it's preheated, carefully place your pizza dough on the pan. Microwave a thin crust for 2 minutes and a thicker crust for 3 to 4 minutes. Remove your browning pan from the microwave, using oven mitts, and set it carefully on a trivet or heatproof surface. 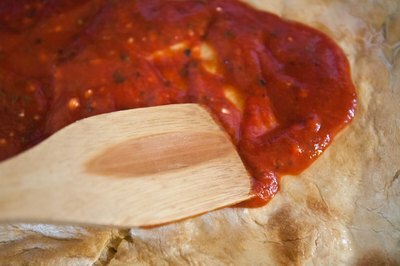 Flip the dough with tongs or a spatula, and spread your sauce on the cooked side. Layer your choice of toppings and cheese over the sauced crust, and return the pizza to your microwave. Microwave for another 5 to 8 minutes on High, until the bottom of the crust begins to become golden and the toppings and cheese are hot and bubbly. 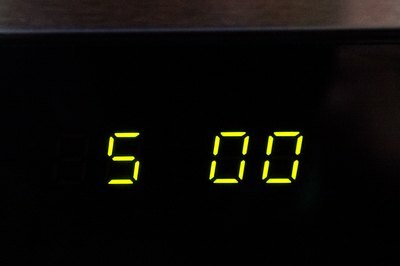 If the cheese or crust seems to be darkening too rapidly, stop your microwave and reduce it to 70 or 80 percent power for the remaining time. 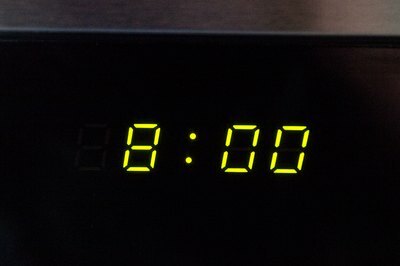 Rest the pizza for 2 to 3 minutes, so the uneven temperatures caused by microwave cooking can even out. Transfer the finished pizza to your cutting board, and cut it into serving portions. 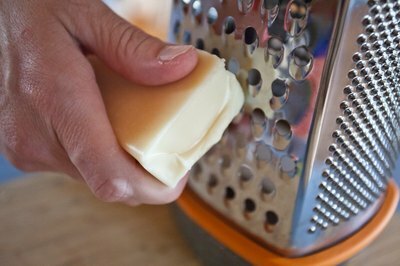 Shred your cheese, prepare the sauce, and chop or slice any other toppings you wish to use. 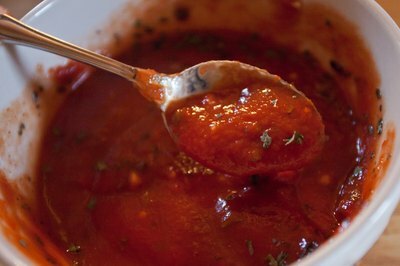 Place the prepared crust on a microwaveable plate, ideally one that's flat on the bottom so your sauce and toppings won't run to the middle. Alternatively, place the pizza on a sheet of parchment paper that's been cut to fit the turntable in your microwave. 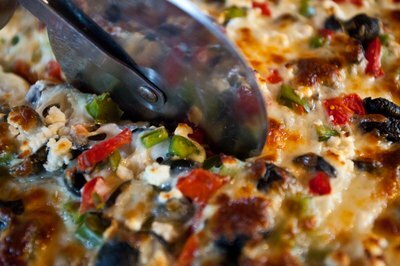 Spread sauce over the prepared crust, then distribute the cheese and toppings evenly.